Mumtaz Residences ... an exterior panorama. LUXURY residential properties worth an estimated $455 million are expected to be developed across the sultanate and the wider Middle East over the next five years by a newly established joint venture set up by Al Raid Group, one of Oman’s largest corporations, and leading British luxury property developer Consero London. The first such project to be undertaken by the joint venture will be 14 large contemporary villas – each around 5,000 sq ft in size – surrounded by large terraces and set in landscaped gardens in a prestigious district of the capital Muscat, according to Al Raid. The villas are best described as being a Middle East version of Kensington’s famous Phillimores development and will set a new benchmark for quality and luxury for European-style homes in the Oman property market, according to the developers. The project, which will commence this summer, is likely to fetch up to $1.5 million for each unit. 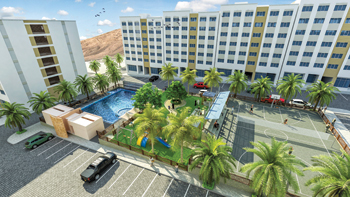 The new properties will be marketed under the Saraya Consero brand name. A new office will be set up in Muscat for Consero Design, the interior design and project management division of Consero London. Saraya, the architectural design and project management division of Al Raid Group, will act as lead consultant to the firm, providing it with invaluable local knowledge, contractor network and local project management expertise. Consero Design is renowned in the UK for design excellence, product quality and specification innovation. “This joint development demonstrated that we work well together and the fusion of our skill-sets creates a real estate product of exceptional quality. We have developed an excellent relationship with Saraya, which is a leading specialist in high-quality architectural design and project management in Oman. For us, Saraya were the partner of choice for our entry into the Omani and wider GCC region,” he says. “By aligning the Saraya and Consero brands, we are creating an exciting fusion product which will deliver a high-quality residential offering that will set new benchmarks in the local marketplace. There is a sustained demand for luxury apartments and large villas in Oman from both domestic, wider GCC and international expatriate buyers,” says Al Araimi. As part of its marketing strategy, the partners will build a four-bedroom show house and marketing suite which is scheduled to be ready around the middle of this year. The joint venture will then focus on developing luxury apartments, penthouses and large villas in locations including Muscat, Shatti Al Qurum and Al Khuwair and some of the sultanate’s integrated tourism complex locations where foreign property ownership has been allowed since 2002. In addition to the core business under the Saraya Consero brand, the partners have also agreed to roll out a “diffusion line” aimed at the broad middle market. The first of these projects, with architecture by Saraya and specification by Consero Design, will be the Mumtaz project near the Qurum Hills district. This development will provide 264 one- and two-bedroom apartments and penthouses scheduled for launch in early 2015. Once a strong presence and sales have been established in Oman, the partners will look at real estate opportunities in the wider GCC region. Founded in 1974, the Al Raid Group is one of the largest diversified corporations operating in Oman. The group’s activities include real estate design and development, oil and gas operations, retailing, jewellery and luxury brands. Set up in 2004, Consero is a multi-award-winning luxury developer undertaking both direct development for prestige market sales and design-and-build projects for private clients. 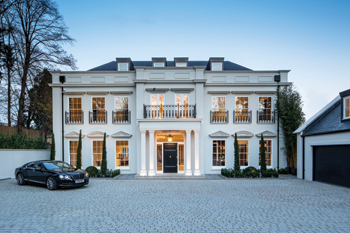 Consero London creates luxury residences with “stately home” quality architecture and interiors and has successfully completed and sold a portfolio of properties valued at over £1 billion (($1.52 billion).